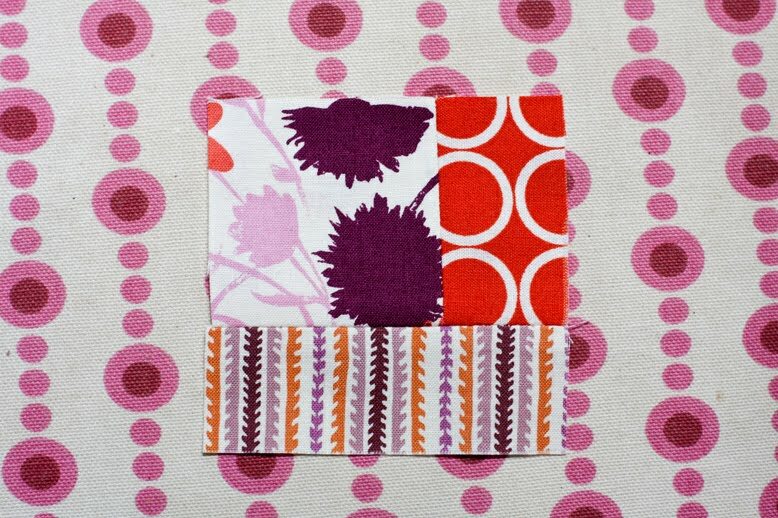 Quilted Coaster Tutorial, a photo by jenib320 on Flickr. This was originally published as a guest tutorial on Sew We Quilt. 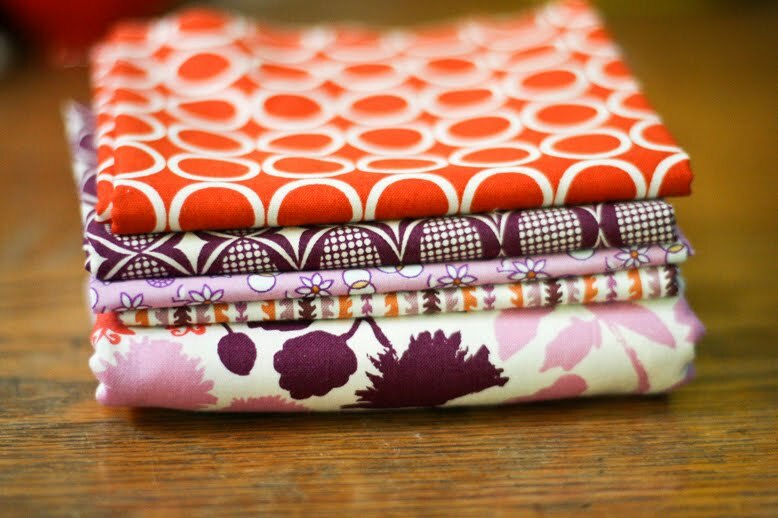 As you're pulling fabrics for this project, decide on one focal fabric. 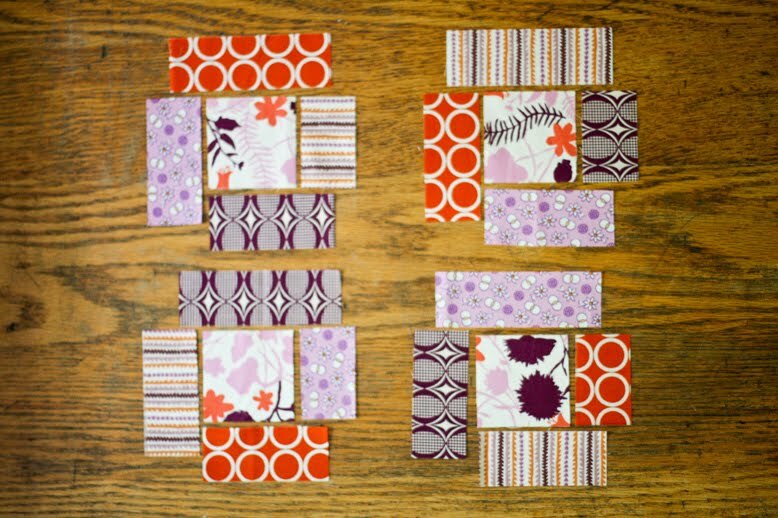 You'll be using it as the center of each coaster and as the backing. I've used batting and basting spray instead of fusible fleece because I like the extra bulk of the batting. It's a little less convenient, but better for the finished product! Cut all your pieces! Once they're all cut, separate into 4 piles, with one of each size, and two 3.5" pieces. Make sure you evenly disperse your prints, one of each for each coaster! 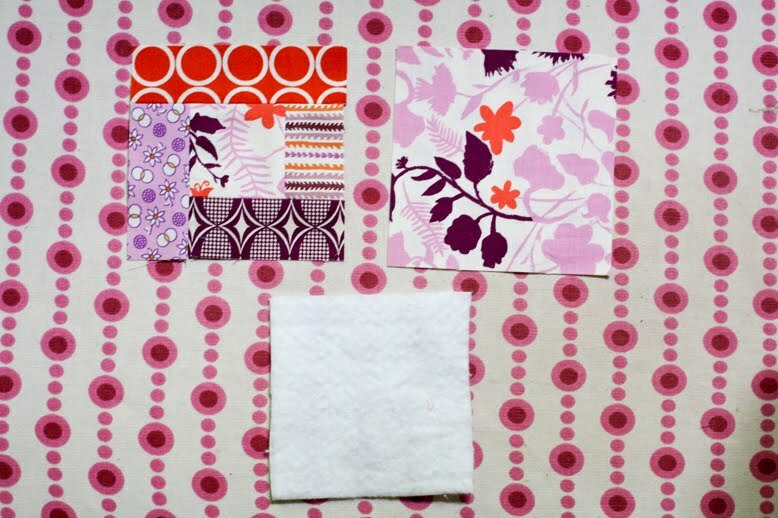 I've created this little diagram to help you visualize steps 1-4, sewing together your coaster top! 1. 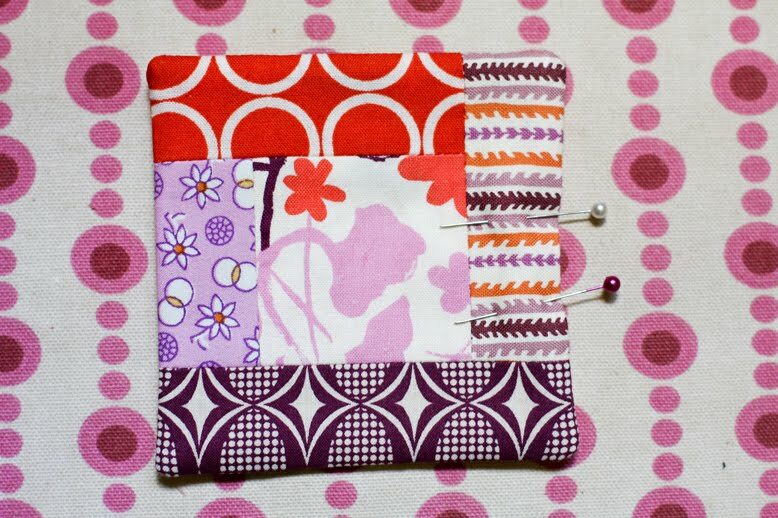 Now, you're going to start by sewing together one 2.5" square and one 2.5"x1.5" piece. Press seams open. 2. Next, moving clock-wise around the center square, sew on one of the 3.5"x1.5" pieces to the bottom. Press. 3. Sew the other 3.5"x1.5" piece to the next side. Press. 4. Sew the 4.5"x1.5" piece to the final side and press. Now you've got the top of one coaster finished! 5. 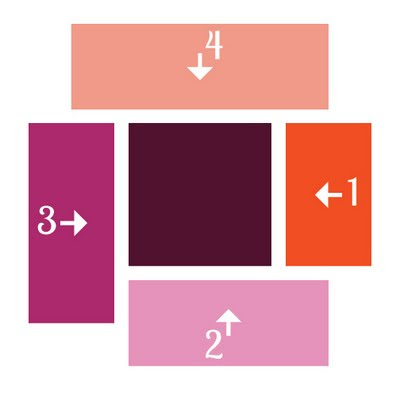 Repeat steps 1-4 for the remaining three coasters! 6. Grab one of your coaster tops, backing square, and batting square. 7. Spray adhesive to one side of the batting. 8. Arrange batting (adhesive side down), to the wrong side of your backing square. 9. Now place your backing and top right sides together. Pin. Sew around all four edges, leaving at least a 1.5" opening on one side for turning. Back-stitch when you start and finish. 10. Clip the seam allowance in your corners. 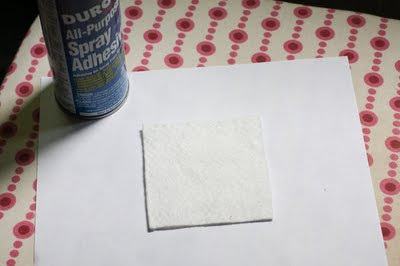 Turn your coaster right side out, using a dull pencil or turning tool to poke out the corners. Pin the opening closed. 11. Stitching very close to the edge, top stitch all the way around your coaster, closing the opening. Back-stitch at start and finish. 12. Now it's time to quilt! 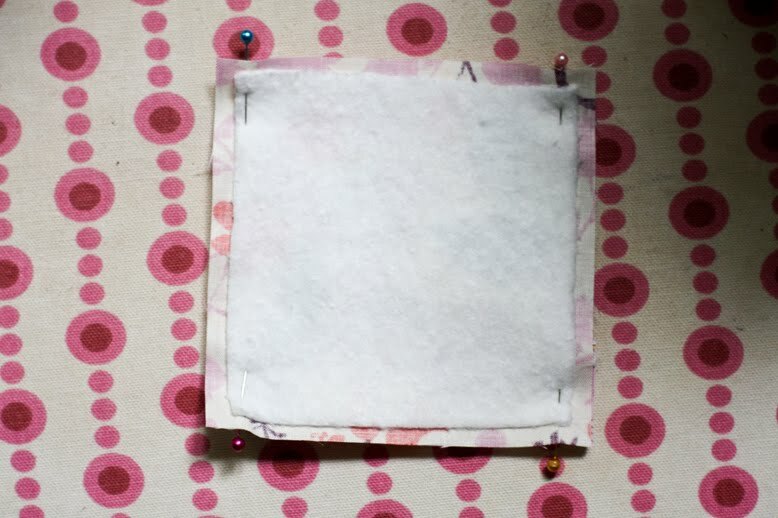 You don't need a fancy foot or anything, for this simple quilting, your regular machine foot is fine. Simply back-stitch at the beginning and end of your quilting lines. Take advantage of your needle-down function to make it easier! 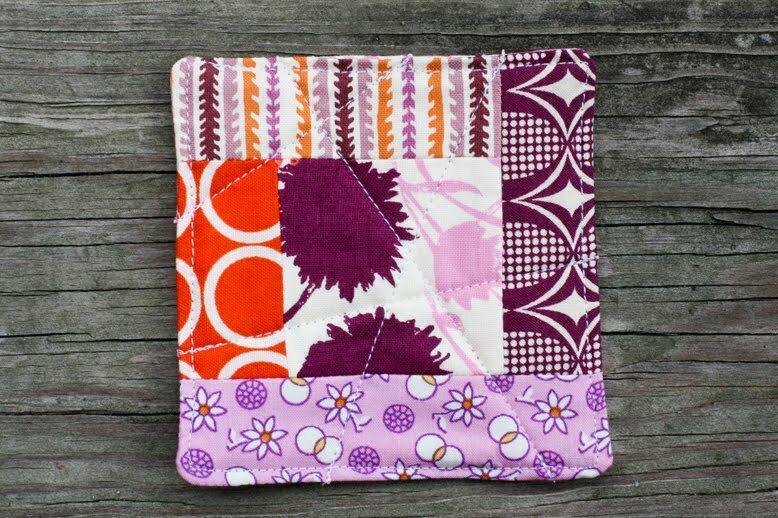 I used a variety of quilting designs for my coasters: shadow quilting (1/4" on either side of each seam), boxy swirl, random diagonal lines and diagonal center crossing. Thank you for the tutorial. This would be a great Christmas gift! Gorgeous Jenni..love your name tag too! 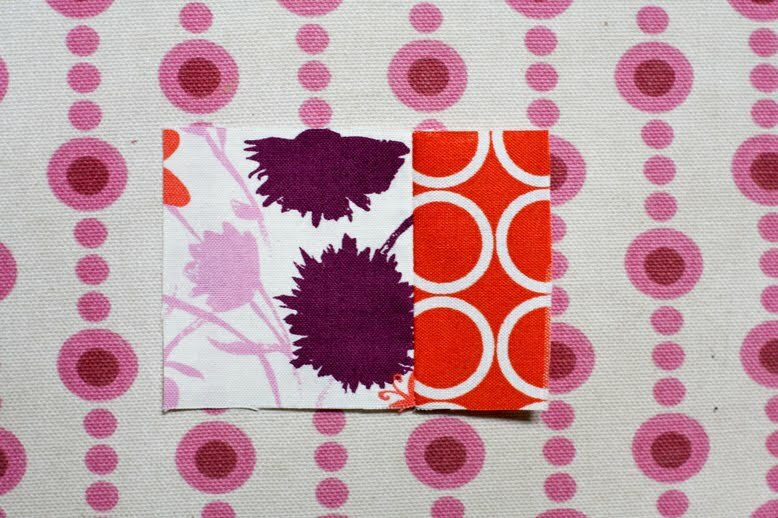 Great tutorial here and at Sew We Quilt! 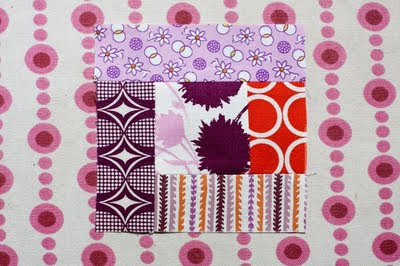 I am a new follower because of Sew We Quilt and I plan on staying around! Thanks for the wonderful share! Great tutorial! Hey - I'm going to be in Madison tomorrow at the Expo! Maybe I'll see you there! I'm VERY impressed with the number of followers you have! Thanks for the tutorial. I'm a new follower. I love your little coasters,what fun fabric. Thanks for the tutorial. Enjoyed reading your tutorial over at Stash Manicure, and had to come check out your blog. Added you to my blog reader! Loved the stash-busting (ha - like I have enough stash to need busting!! NOT!!) coasters!! More like, I hate to throw away perfectly good fabric, even if it's only tiny scraps, so this is a great user-upper! I've subscribed to your posts & can't wait to read the next one! I've also hopped over to etsy & added you to my favorite shops!! :) Thanks for playing along with Madame Samm! I am here from Stash Manicure, and have loved looking around!! I love your vintage sheets, and your pyrex!! Thanks so much for a great tutorial!! Cool! I love the fabrics you chose, but I always do, so no surprise! Great tutorial and beautiful fabrics. I`m new follower. Thank you for the tutorial. I'm a new follower! I really need to make some of these! We can always use more coasters. Thank you for the tutorial! I'm a new follower. Hi Jenni ! Thanks for the tute ; here from stash manicure ; I have wanted to do a log cabin and this is a good start for me !! thanx for a great tute! 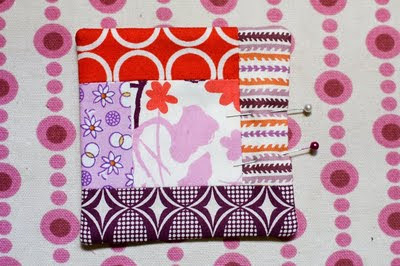 i'll dredge up some pretty scraps and make some, too. i'm one of your new followers ... you've a great blog, good reading. will be back to read again your tute on the big star; have been looking for big blox, and you've done such a good job, i may be able to do other big blox, too. great tutorial - thanks for sharing your awesome coasters, I love making them. that's some fab fabric! Perfect timing! 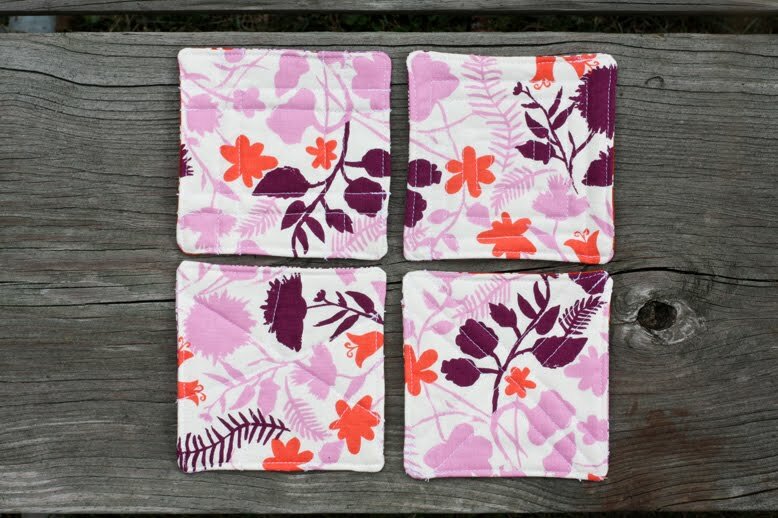 A friend just told me that she needed new coasters! Great tutorial! Thank you for the close up pictures of the coasters, I wanted to see the quilting better. They are just great!! I loved the tutorial. I am now a follower of yours from Sew We Quilt. Hi Jeni, great tutorial, Thanks. Really cute idea! 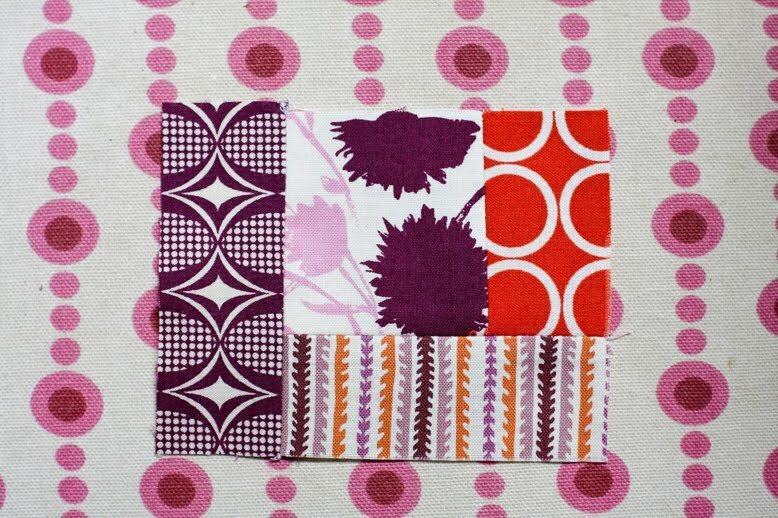 I found you through Sew We Quilt. I'll be back to check out your site thoroughly. I came over from Sew WE Quilt. Love the tute! I signed up to follow your blog and now I'm going to go take a look around. Thanks for sharing and have a terrific day! I have come over from SM and I must say I love the look of your blog! Colour, colour and yet more colour - now to read rather than look!! Love the tutorial!!! I will be making a few sets for Christmas gifts!! Dropped in from SM. 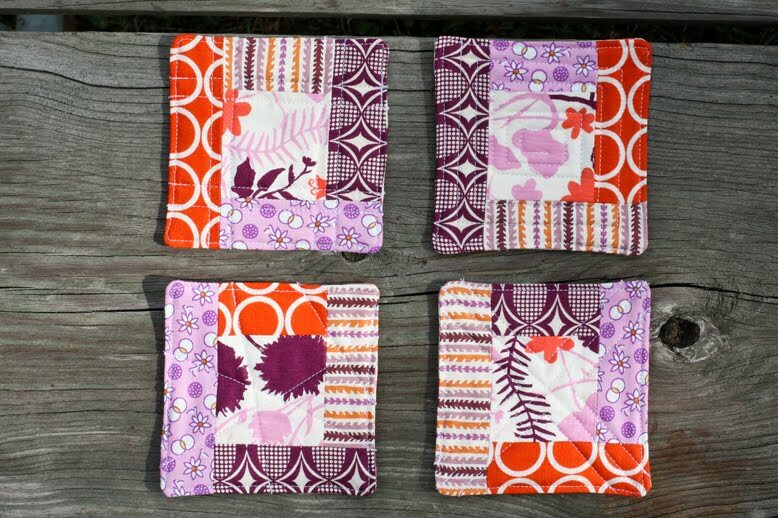 Great tutorial on log cabin coasters :). Another design to add to the Christmas list. I'm a follower now as I found lots of interesting things on your blog. I have a few Pyrex dishes with designs different to the ones you show. cute idea. I want to make some! 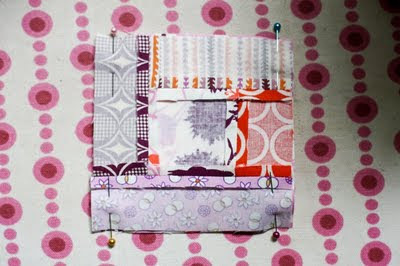 I love log cabin piecing!!! Great post Jeni and so wonderful to meet you! I have two house bunnies as well! Hop over and visit with us sometime! I'm following along with you so I can stay in touch. Just popped over from Stash Manicure...thanks for the great tutorial. You did a good job! Thanks for the tutorial - super cute and practical! 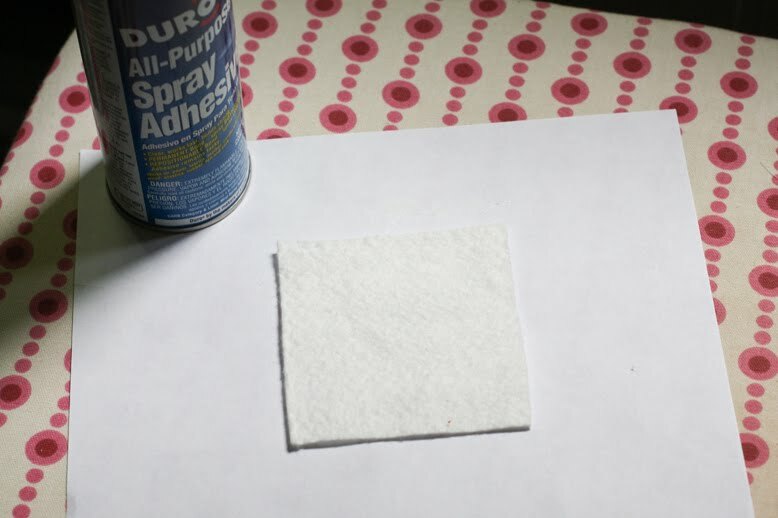 I found this post through Craftsy. These are just the thing I need to complement my present for a sister. Thanks! So exactly where is this tutorial? All I can find is the pictures. Just stitched a set with the intention of giving them as a gift, but I ended up liking them so much that I kept them! Thanks for sharing this wonderful tutorial. Thank you for this, Jeni! Just made a set for a sweet young guy and his new bride. Perfect, and easy to follow! Either the pictures for yours are really close up or mine are a lot smaller. A cup fits on them but they still look a lot smaller than the pics! Cute idea, I have a ton of fabric that I had no idea what to do with.